Southern Alaska to California, and east to North Carolina. Generally low to middle elevations in dry to moist woods and open areas. Will grow in partial shade, but prefers open areas. Thickets, open and/or rocky slopes, dense woods (forests), along roadsides, on sandy river banks, in deciduous uplands, and under Pacific madrones. Full sun to partial shade. Warm, dry slopes and forests, or warm, moist slopes, or riparian benches and terraces. Occurs as a climax species in early, mid, and late succession. Considered both climax and seral species. Collect September-October through the winter. Separate the seeds from the fleshy covering. Has a very tough, hard, and impermeable covering so the seeds are very hard to germinate. A 20 to 91 day warm stratification period followed by a cold stratification period of 60 to 300 days. 7-10 years under the right conditions. Dry and store at below 5oC. Cuttings are easily rooted. Seeds can be sown in the nursery. Runners can be cut and propagated into healthy plants. Bare root is very common and easy to plant. Seeds should be stored in a mixture of moist peat and sand. Transplant runners into perlite. Once seedlings have been established, they have good survival rates. Bare root has also been successful. Depends on area to be planted. 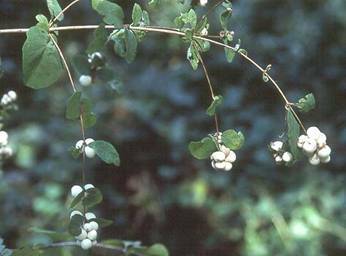 It can be established in thickets (dense planting), as an understory plant (sparse planting), or just an ornamental in a garden (very few). Water until established root system. Water enough to keep the soil wet, but not saturated. Once established, will tolerate drought well. Approximately only 2-6 feet tall, and can live 40+ years. 7.) Pojar, Jim, Mackinnon, Andy. Plants of the Pacific Northwest Coast. Canada: Lone Pine, 1994.